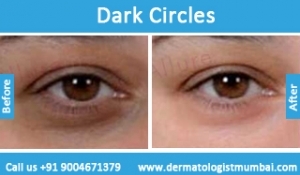 Dark circles are dark discolorations of the skin under the eye. 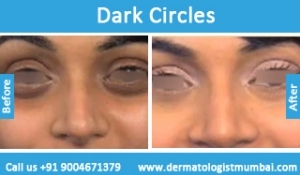 Commonly known as dark rings or shadows, these are scientifically known as Periorbital circles, periorbital hyperpigmentation or periorbital melanosis. 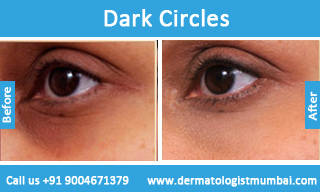 Dark circles are not a serious skin problem but they make us look exhausted, unhealthy or older than our natural age. However, there are removal treatments offered by professionals at The Esthetic Clinic that can help anyone with such a problem. What are dark circles and its main causes? 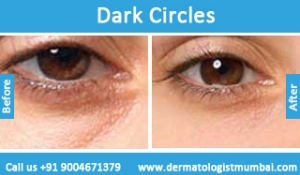 Men and women of all ages can have dark circles. Commonly there are two types of dark circles- blue and black or brown. 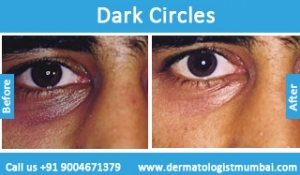 The blue circles are formed due to pooling of oxygenated blood in the under-eye skin, whereas the brown/ black circles are formed due to hyper pigmentation of the skin around the eye. Dark circles appear when the tiny blood vessels under the under-eye skin start leaking. Enzymes produced to clean this leak, by the body break down the red blood cells. This leads to the discoloration of the area under the eye, for example blue or brown/black. Aging is another cause that leads to appearance of dark circles under the eyes and puffiness of the eyes. The skin under the eyes is thin and delicate, and with age it becomes thinner, making the blood vessels even more prominent, which causes dark circles. Some people have it due to their hereditary genes. Nutritional deficiency also be a prime cause.A person whose dietary intake is deficient in vitamins like A, C, K, E and other vital nutrients may have to deal with this problem of dark circles. Sleep deprivation and constant exhaustion make the blood under the eye more visible and the skin to appear blue or black/ brown. Dark circle reduction treatment Needs identification of the underlying cause And treat the pigmentation in addition. Pigment reduction laser treatments that can be effective depending on the cause of dark circles. For blue under eye circles, reduction treatment may include intense pulsed light therapy or pulse dye laser technique. We also recommend Filter/ fat injection in some cases where the causes are under-eye volume loss for dark circle removal treatments. Under-eye botulinum toxin is advised if there is any presence of wrinkles or fine lines under the eyes which leads to the darkening of the region. Acugel treatment or Hydrafacial treatment based on iontoporesis, which helps in delivering the active ingredients deep into the area of skin where the medicine is required, is also provided. This improves blood circulation and reduces edema that causes puffiness under the eye. 6-8 sessions of 20-30 minutes each are required for completion of this treatment. For cases dealing with malar festoons, a combination of Fractional CO2 Laser Treatment with fillers or other applications may help in dark circle reduction. For extreme cases, eyelid surgery or Blepharoplasty, is generally the most effective This surgery is performed by our well trained Oculoplastic Surgeon. The Esthetic Clinic has been co-founded by Dr. Rinky Kapoor, a leading name in the niches of cosmetic dermatology, skin laser treatments and Dermatologist in Mumbai. The treatment cost may vary depending on the treatment techniques and the number of sessions required for the treatment. The truth is that dark circles are bad and they can wreak havoc on your self confidence. Waking up every morning and seeing the dark area under the eyes can feel horrible and it can be tough to actually face the day. Sometimes, we are not confident enough to actually seek proper treatment for our skin troubles. Treatment is important because if treatment does not happen in time, it can lead to worsening of the condition. Getting the right kind of treatment for your dark circles as soon as possible is smart. If you are looking for treatment, then the good news is that you have many options available. Creams: The first thing you should try for dark circles treatment in Mumbai is creams. There are several treatment creams meant for this purpose. You can try any of those or you can visit a treatment dermatologist who will prescribe you one that is specific for your skin type. 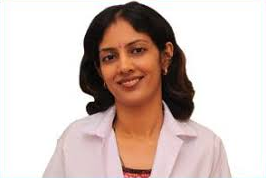 Laser therapy: This is a dark circles treatment in Mumbai that is offered by many dermatologists and is perfect for you if your condition is chronic and cannot be handled by treatment creams and treatment lotions. Laser therapy treatment is non-invasive and will treat your problem once and for all. 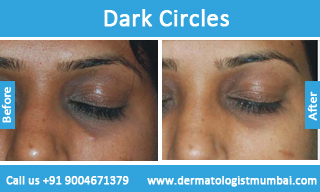 Filler injections: This is another dark circles treatment in Mumbai that can be wonderful for you. Filler injection treatments are not painful and the procedure happens quickly at The Esthetic Clinics. The treatment effect will be long-lasting. No matter how mild or severe your dark circles are, there is hope on the way. If you are not looking for professional dark circles treatment in Mumbai, you can do a good job with make up. Hiding dark circles till they go away on their own or till you decide when to see Dr. Rinky Kapoor at The Esthetic Clinics, is a great idea.